Job hunting is the act of looking for employment, due to unemployment or discontent with a current position. The immediate goal of job seeking is usually to obtain a job interview with an employer which may lead to getting hired. Common methods of job hunting are finding a job through a friend or an extended business network, personal network, online social network service, or employment website. Many job seekers research the employers to which they are applying. Some employers see evidence of this as a positive sign of enthusiasm for the position or the company. outplacement: The process of helping to find new employment for redundant workers, especially executives. social networking: The use of Internet communities to network and communicate using shared interests, related skills, or geographical location between consumers and businesses. Job hunting is the act of looking for employment, due to unemployment or discontent with a current position. The immediate goal of job seeking is usually to obtain a job interview with an employer which may lead to getting hired. The job hunter typically first looks for job vacancies or employment opportunities. As of 2010, less than 10% of U.S. jobs are filled through online ads. Common methods of job hunting are finding a job through a friend or an extended business network, personal network, or online social network service; using an employment website; looking through the classifieds in newspapers; using a private or public employment agency or recruiter; looking on a company’s web site for open jobs, typically in its applicant tracking system; going to a job fairs; using professional guidance such as outplacement services that give training in writing a résumé, applying for jobs, and how to be successful at an interview. 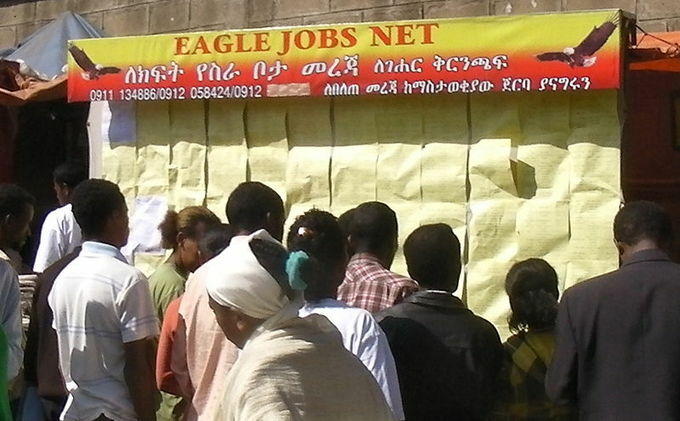 Jobseekers in Ethiopia: Job seekers in central Addis Ababa, Ethiopia review advertised opportunities. Many job seekers research the employers to which they are applying, and some employers see evidence of this as a positive sign of enthusiasm for the position or the company, or as a mark of thoroughness. Information collected might include open positions, full name, locations, web site, business description, year established, revenues, number of employees, stock price if public, name of the chief executive officer, major products or services, major competitors, and strengths and weaknesses.